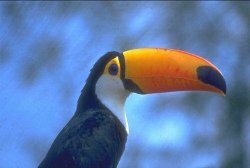 - Brazilian Side Waterfalls full day Tour. Waterfalls Tour, Brazilian side: The tour starts at the Visitors Center of the Park where thematic buses take you to the beginning of the footbridge. We go through this footbridge making stops at the balconies until we get to Puerto Canoas where a food area is and a shopping walk. From here we start coming back on the bus of the Park to the Visitors Center, same place from where we start the tour. 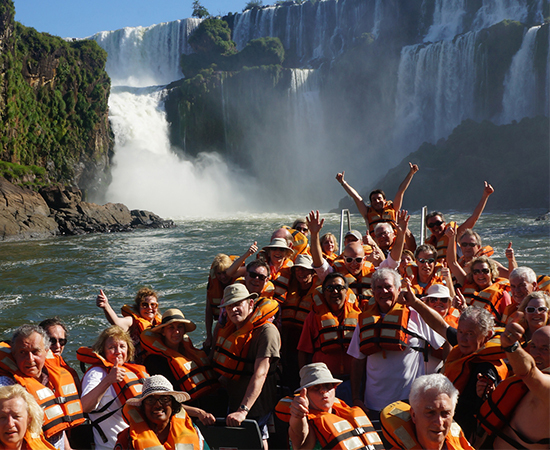 - Argentinean Side Waterfalls Tour full day Tour Waterfalls Tour, Argentinean side. 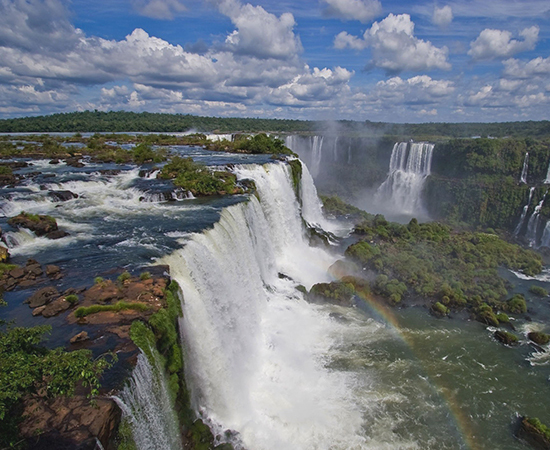 The Iguazú Waterfalls are 275 cascades that are visited through different access. 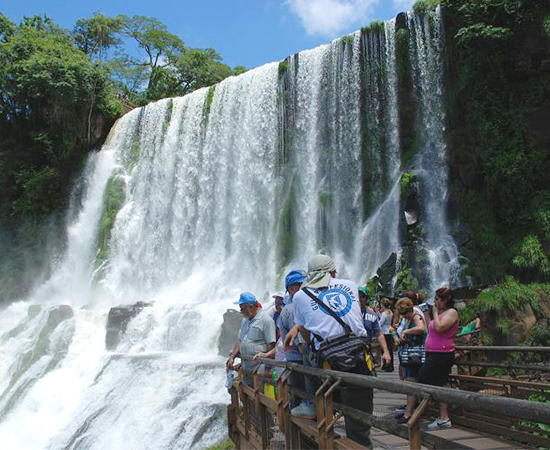 The footbridges and the navigation tours take the visitors closer to the waterfalls to live an unforgettable experience. From each rest, each view balcony, you can enjoy amazing views in the middle of subtropical vegetation full of shrubs, birds and wild animals. 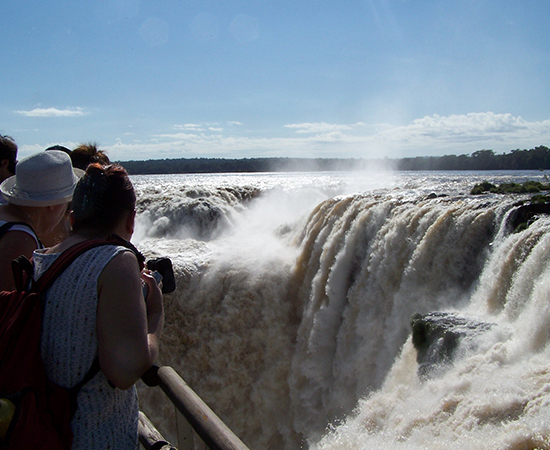 The tour starts at the Visitors Center and then we go through the Argentinean waterfalls traditional tours: Superior Circuit: Panoramic view of the waterfalls. Lower Circuit: Going closer to the Jungle and the Waterfalls, to the impressive Garganta del Diablo after walking on the 1.000 mts. footbridge. 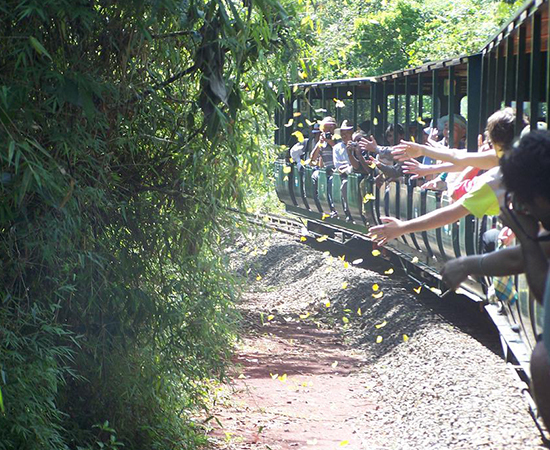 On our tour we include the Ecological Train of the Jungle and visit the Nature Interpretation Center located in the visitors Center. The Great Adventure is unique, and combines the whole essence of the Iguassu National Park in one ride: the jungle and the waterfalls.It is offered daily every full hour, and the departures are from our Head Office or The Visitors Center. It starts by entering the jungle from the “Sendero Yacaratía” trail with special transportation that allows a panoramic view of the environment along with experienced guides that give a lot of explanations as well as the legend of this spectacular place. With motor-boats, we take visitors 6 km through the Canyon of the Iguassu River, until the falls, from these total, 2 km are river rapids. After enjoying the view from the calm side of San Martin Island we sail to the “Tres Mosqueteros” waterfall, at that point, the Brazilian and Argentinean sides and the Devil’s Throat can be clearly appreciated.After that, we sail along the shore of the island until we get to the most exciting part where we face the San Martin waterfall, a wonderful and unforgettable experience, for it’s the largest waterfall any motor-boat can approach safely. Comments: Here you can let us know about any spesial request.